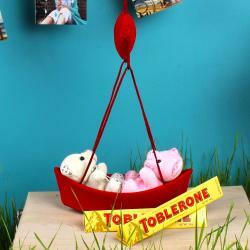 Product Consists : Tom and Jerry Soft Toy ( Approx Size : 8 Inch) and I Love You Icing Home Made Chocolates Box. Every one needs a hug it does so many things it brings joy and comfort. 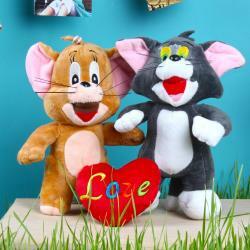 This is an incredible gift items like Tom and Jerry Soft Toy with I Love You Icing Chocolates for your loved ones. Teddy can be used as a decorative piece like for your living room, hall or bedroom gives attractive look of your place. Apart from decorative purpose, it is also known for a brilliant choice gift that can be presented to your near ones on their auspicious occasions. Wonderful gifts that can be given to girl friend, wife or any one to make them feel happy and excited. It is a love caring theme gifts for your sweet heart which is sure to bring a smile on her or his face on any gifting occasion via Giftacrossindia. Say Happy Valentine's day and if it is your first Valentine then you are much excited to be with your LOVE deliver this beautiful gift So he/she can be proud to be your Valentine. Make your dear ones feel special by sending this perfect gift combo to him on any special occasion Like Valentine's Day, Birthday, Anniversary and Many more. This gift is exclusively available at Giftacrossindia.com only. Browse your favorite products, it is very conveniently available for online shopping from anywhere in India with Free Shipping. 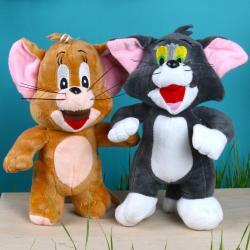 Product Includes : Tom and Jerry Soft Toy ( Approx Size : 8 Inch) and I Love You Icing Home Made Chocolates Box.